One of the big problems with psychology and psychiatry is that diagnosing patients relies heavily upon subjective, qualitative observations instead of more rigorous quantitative methods. In fact, publication of the fifth edition of the Diagnostic and Statistical Manual of Mental Disorders (known as DSM-5 and colloquially referred to as the “Bible of psychiatry”) caused a major controversy precisely because its recommendations made no effort to incorporate biological evidence. A field that refuses to incorporate quantifiable markers of disease is going to have a difficult time gaining credibility. Thankfully, many in the profession are aware of this problem and are attempting to rectify it. 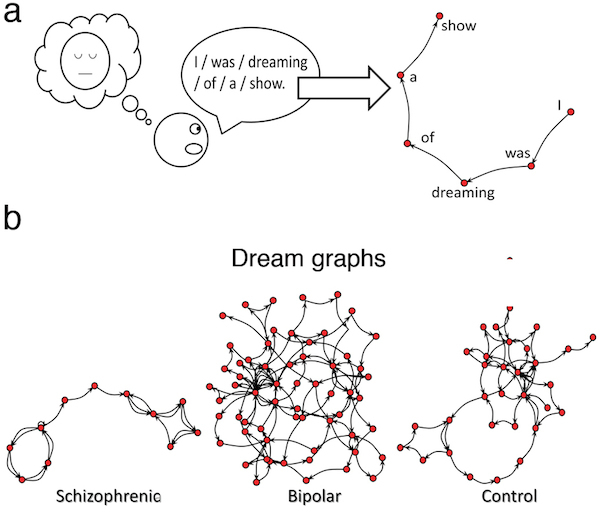 Now, a team of Brazilian researchers has demonstrated that the word patterns a person uses when describing a dream can distinguish between schizophrenia and bipolar disorder, a pair of mental illnesses that is often difficult to tell apart. As shown in panel B, schizophrenic and bipolar patients displayed strikingly different word graphs from each other and from healthy controls. Schizophrenics tend to discuss their dreams using very few words, while those with bipolar tend to speak excessively and repetitively. Interestingly, creating word graphs from stories told by the volunteers about a time when they were awake yielded far less useful results. There is something about describing a dream in which the underlying pathologies become much more obvious.